This chapter briefly veers into the point of view of Mrs. Lithebe. She is a good woman who had a good husband who built her a good house with many rooms, but they never had any children and so the rooms were empty. She is happy to have Stephen there, because he is a good man, and to have Gertrude and the child there, because they are Stephen’s and he is taking care of them. But she does not let rooms to strangers, because she does not need the money. She is a little troubled by Gertrude’s loose manner, and is worried about her young child. Because Mrs. Lithebe does not need money, she is uncorrupted by Johannesburg. Her views about Gertrude may seem strict and moralistic, but she understands what must be done to survive Johannesburg, and understands that Gertrude does not have the discipline to achieve it. Stephen asks Mrs. Lithebe if she would also be willing to take in Absalom’s pregnant girlfriend. He says that he will eventually bring her back with him, but until he leaves Johannesburg, he wants her out of the other house. Mrs. Lithebe agrees, though there isn’t a bed for the girl. Stephen says that it’s better for her to be in a good house among good people and on the floor, than in a place like she is now. He goes to fetch her, and observes that his money is running low. As Mrs. Lithebe’s house fills up, so the tribe is being slowly restored. Her home is a kind of Ixopo-away-from-Ixopo. Stephen brings the girl to Mrs. Lithebe’s. Mrs. Lithebe is pleased with the girl’s manner, and her gratefulness for being there. Gertrude is pleased because a new woman around will help alleviate her boredom. There is a moment where Mrs. Lithebe overhears the girl making “careless laughter,” for which she scolds her. The girl agrees not to do it again, and is true to her word, and Mrs. Lithebe is content. Mrs. Lithebe decides to deal with the problem of “carelessness” as soon as she sees it in the girl. The issue is not laughter, it is "careless" laughter. Laughter that does not respect the dignity of others or oneself. The girl's willing response to Mrs. Lithebe's criticism is a good sign. Stephen returns to prison to visit Absalom. Stephen asks after his health, and then asks him, again, if he indeed wishes to marry the girl. Absalom says that he does, and Stephen assures him that it will be arranged. He also mentions that he has found a lawyer. Absalom is happy about this. Stephen asks if Absalom has continued to stick to his story about the other boys being there, and he says that he has, though the boys, once his friends, are furious about it, and continue to lie. Stephen baits him, asking when, exactly, he realized that these untrustworthy friends are so untrustworthy. Absalom resists these questions. Stephen pushes and pushes until he realizes that he will receive no satisfactory answer. He tells Absalom that the lawyer will come soon, Father Vincent will come to take his confession, the marriage will be arranged, and the girl and her child will come back to live with Stephen and his wife. Stephen desperately wants answers—why did his son do what he did? Why was he spending time with such a bad crowd? But even Absalom can't provide those answers. Even he doesn't know. Stephen is searching for answers that he will eventually come to understand, but that cannot be simply answered by one individual. Meanwhile, Absalom comes off not as a cruel murderer but as a confused young man who made a dreadful mistake. His willingness to marry his girlfriend shows the good in him. Mr. Carmichael, the lawyer, arrives at Mission House. He talks to Stephen about the trial, and offers to take it pro deo, for God—that is, for no money. He talks to Stephen about the information that he needs to defend Absalom. After he leaves, Stephen marvels that a man would take such a case for nothing. Again, when money is shunted to the side, good people are involved. Mr. Carmichael is a good man, helping because he understands that Stephen needs help, and it is the right thing to do. Machado, Carmen. "Cry, the Beloved Country Book I, Chapter 17." LitCharts. LitCharts LLC, 5 Aug 2013. Web. 18 Jan 2019. Machado, Carmen. "Cry, the Beloved Country Book I, Chapter 17." LitCharts LLC, August 5, 2013. 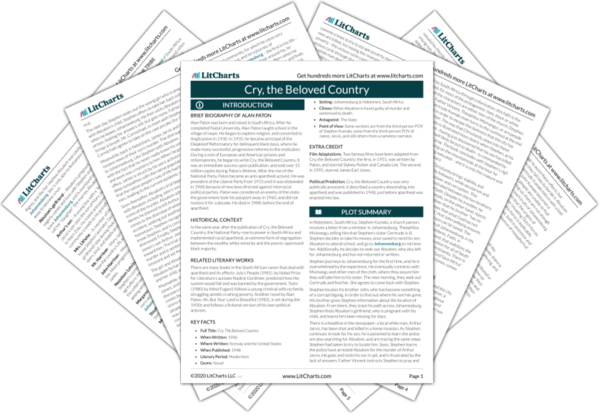 Retrieved January 18, 2019. https://www.litcharts.com/lit/cry-the-beloved-country/book-i-chapter-17.